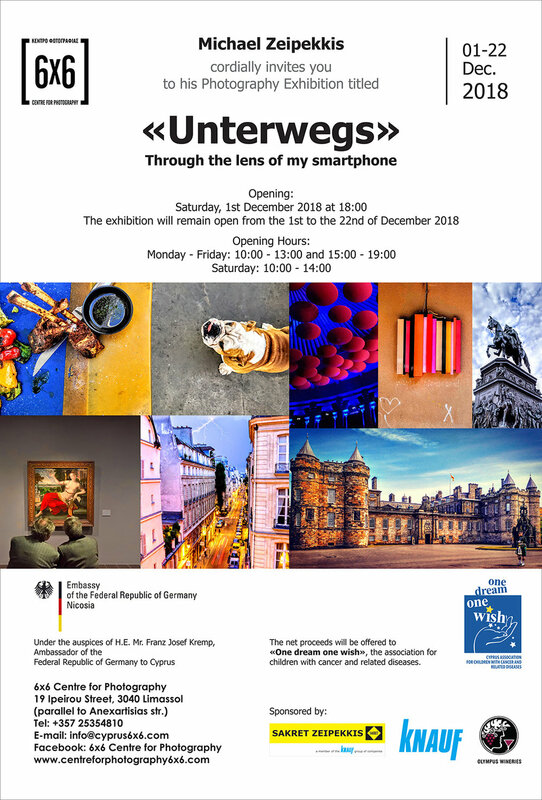 Michael Zeipekkis cordially invites you to his photography exhibition entitled, "Unterwegs", at 6x6 Centre for Photography in Limassol. The exhibition opens Saturday, December 1st, 2018, at 6p.m. and will remain open for the public until December 22nd. Being for decades an avid “analog” amateur photographer who discovered the beauty and unlimited potential of mobile digital photography just five years ago, Michael Zeipekkis has been trying ever since to catch the ”wow” moment that makes a picture special by exclusively using his smartphone. Thousands of interesting and unusual moments have been gathered since his first mobile picture was taken and a collection of those, that Michael wishes to share with the public, will be exhibited between the 1st and 22nd of December at the 6x6 Centre for Photography, in Limassol. Images and scenes from in and out of Cyprus will be on display and offered for sale, while the net proceeds will be donated to the Association for Children with cancer and related diseases “One dream one wish”. The event is under the auspices of H.E Mr Franz Josef Kremp, Ambassador of the Federal Republic of Germany to Cyprus. Art and the business of art: do it anyway! Do you wish sometimes it were easier to make your art? Is your partner, or family members unsupportive of your creative endeavors? Can you not make time to make your art? 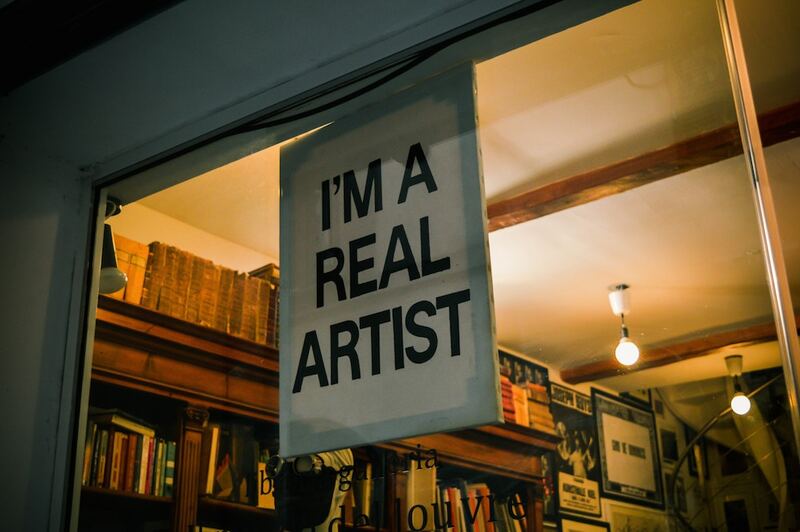 Is the business of art overwhelming? Are you devastated by submission rejections? All these are contemporary symptoms of avoidance to express your creativity. In this presentation, you will learn to rise above hindrances and to do it anyway! Committed to the arts at a very young age, Nefeli played the mandolin in a children’s choir in Limassol where she grew up and earned degrees in photography and film and media arts. Now a licensed life coach in New York State and certified creativity coach, she helps her clients to lifestyle transformation, to enhance their creativity and wellness and presents her own engaging and transformative workshops in New York City. Nefeli produces narrative films that celebrate the human condition and has worked in the film industry, as a freelance designer, videographer, and a photographer, and over the last 17 years teaches and designs curriculum in filmmaking production, photography and other visual art for all ages (5-77 years old). Nefeli has won professional commercial awards for her video and photography work and has extensive experience as an adjunct professor in Filmmaking Production at Temple University in Philadelphia, PA, SUNY at Buffalo, NY and taught the course of Interpersonal Communication at CUNY in NYC. She has worked as a consultant with healing and wellness groups over the last 4 years and has developed programs and courses of study for those seeking to dive deeper into personal transformation, enhance their creativity, as well as for arts professionals desiring training and supervision. Instant Dreams by Willem Baptist is a visual tribute to the fascination of Polaroid photography. When Polaroid announced the end of instant film in 2008, the last still working factory was bought by a small group of enthusiasts. Among them is the retired scientist Stephen Herchen who is still trying to unravel the secret of the lost chemical formula. TICKET PRE-SALE at 6x6! CALL 25354810, or drop by from 09:00 - 18:00. Each ticket costs €2. Join our next practical photography course organised on a six week basis (in small groups), and starting on Saturday, April 14th. A simple and comprehensible learning method is applied, including theory of photography, Photoshop techniques, hands-on photographic sessions, outdoor photography and studio photography (in the Centre’s fully-equipped studio). To reserve your place please call (+357) 25354810 or email info@cyprus6x6.com for more info. Please click here for the course outline. 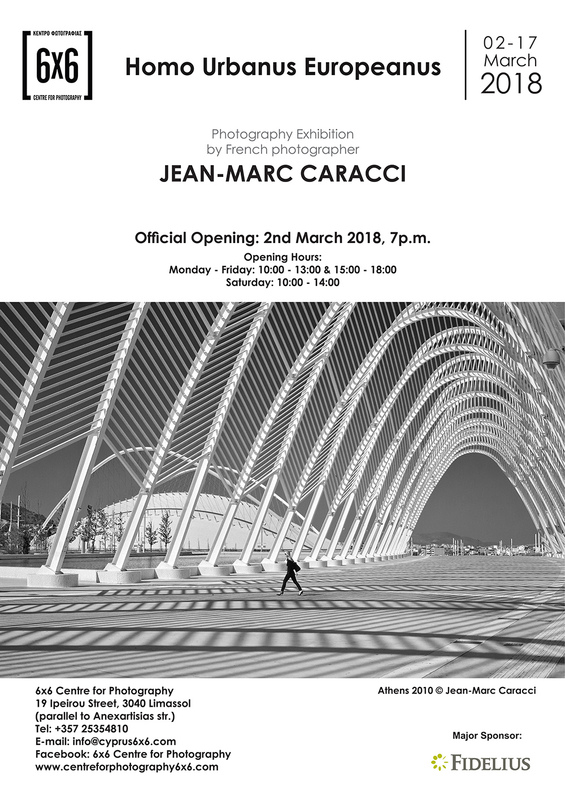 6x6 Centre for Photography is proud to present French photographer Jean-Marc Caracci's photography exhibition entitled Homo Urbanus Europeanus. The series of photographs “Homo Urbanus Europeanus” has been the subject of 29 exhibitions in 22 countries, across Europe and the world. The exhibition was first presented in Cyprus within the framework of Pafos 2017 European Capital of Culture, and now travels to Limassol. Jean-Marc Caracci has travelled to 39 European capitals (including Nicosia in 2015) to photograph "the man in his urban environment" or, according to the artist, "the urban being". Every photograph of the series “Homo Urbanus Europeanus”, by the accuracy of its framing and its crisp style, is a hymn to the magnificent citizen. This human presence, captured with fineness, gives the city an unexpected beauty and majesty. 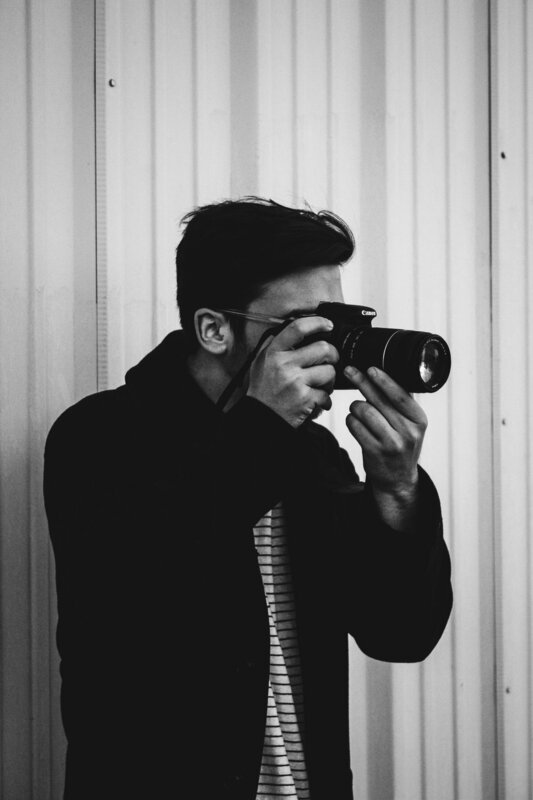 "Whilst taking photographs in a city, I see myself as a private detective, investigating the comings and goings of humanity, similar to a biologist observing movements inside a cell. Capturing people in their urban environment opens a way to explore my own humanity". Jean-Marc Caracci was born in Tunisia, his heritage is 100% Sicilian, but he has lived in the south of France, Montpellier, since his early childhood. With help and support from his elder brother, he started photographing and using the darkroom at the age of 15. When he was 20, he joined the army and was fortunate to be appointed the official photographer of the regiment. Being a self-taught photographer, during his time in the army he developed his skills and technical expertise in photographing people. He has always focused on Man as a representation of belonging, and rarely as a social object. His work is strongly influenced by photographers like Henri Cartier Bresson, Elliott Erwitt, Raymond Depardon… and also by the American painter Edward Hopper. 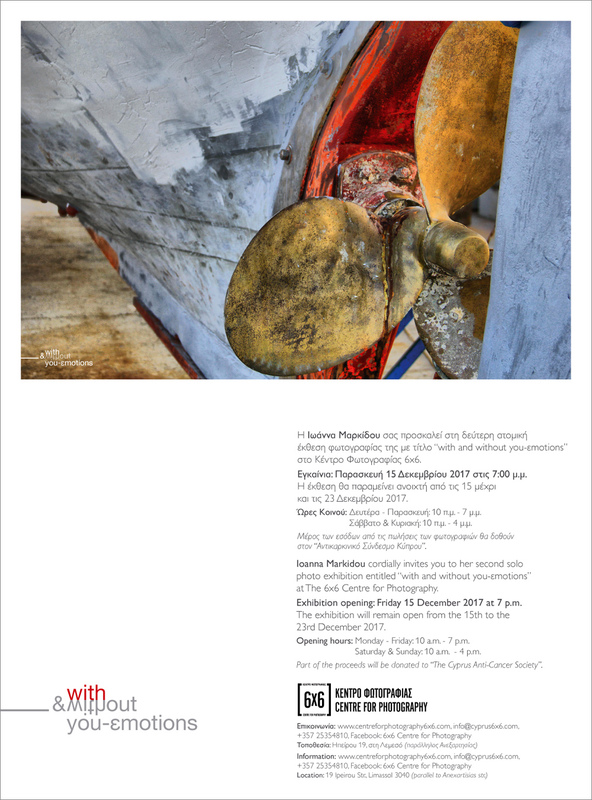 Ioanna Markidou cordially invites you to her second solo photo exhibition entitled “with and without you-εmotions” to take place at 6x6 Centre for Photography. Opening: Friday 15 December 2017 at 7 p.m. The exhibition will remain open from the 15th to the 23rd December 2017. Opening hours: Monday - Friday : 10 a.m. - 7 p.m. & Saturday & Sunday : 10 a.m. - 4 p.m.
Part of the proceeds will be donated to The Cyprus Anti-Cancer Society. 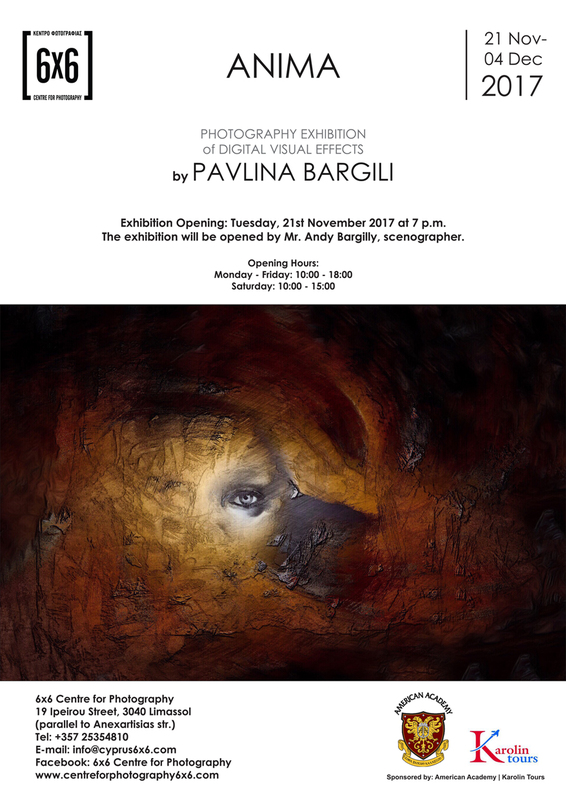 Exhibition Opening: Tuesday, 21st November 2017, 7 p.m.
6x6 Centre for Photography presents the photography exhibition ANIMA, by Pavlina Bargili. The exhibition, which exclusively presents photographs of digital visual effects, will open on Tuesday, 21 November 2017, at 7p.m. and will remain open to the public until the 4th of December. The exhibition will be inaugurated by Mr. Andy Bargilly, scenographer. Language and words are often imprecise - they can neither express nor describe the love, the loss, the tragedy or joy felt deep inside the human soul. Working with digital photography, capturing faces is, in fact, an act of profound intuition. "I create for all those things that deeply matter to me. I create to challenge this intuition; a type of work that gives me access to a depth of emotions, to all the complex feelings lying beneath those faces. Their soul - anima", the artist mentions. Pavlina Bargili comes from Famagusta. She studied jewellery design in Austria and is the owner of the jewellery store in Atlantica Miramare Hotel in Limassol. This is her first exhibition titled Anima.